Crafty Cash Rewards - Earn 5% Back! Sign up for our "Crafty Cash Rewards Card" when you're in the shoppe! Complete seven purchases and receive a "Crafty Cash" rewards voucher equal to 5% of your total purchases. We keep the card here for you, track your purchases, and call you when you have rewards to redeem! Easy! Rewards are not issued for taxes or the purchase of gift cards. Rewards are issued when gift cards are redeemed. ﻿Rewards vouchers must be redeemed in one transaction, are valid for 30 days from the date of issue and have no cash value. Be sure to fill out your card & start earning FREE crafting cash today! Be sure to like ﻿our Facebook page, you never know when we'll post a lil' something extra just for our Facebook fans! Our ﻿email newsletter is the best way to stay up to date on new classes and events, fabulous new products, and new promotions. 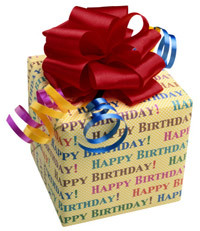 Enjoy 15% off your entire purchase of $50 or more of regular priced merchandise once during your birthday month.